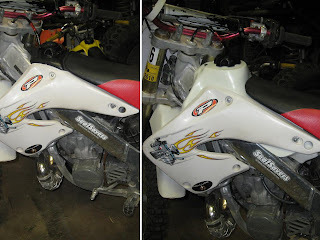 When you own a motocross bike, you tend to be a little limited on the range that the gas tank will provide. This is fine if you tend to do short rides, ride at a track, and/or something similar where a large supply of gas is not needed on the bike itself. If you do chose to do longer rides, there are a number of different options available. The option I decided on is the Clarke 3 gallon tank. This adds an additional 1 gallon over the stock 2 gallon tank, and is the same size as many off-road style 2-stroke bikes currently in production. This extra gallon of gas really goes a long way on a dirt bike. 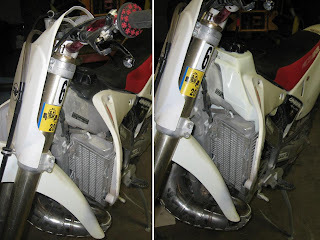 I have seen tanks as big as 3.7 gallons as with the IMS tank, but for me the extra .7 gallons was just not needed and to get the extra capacity I would have to deal with a giant top section that in my opinion really ruins the look and some of the functionality of the bike. The Clarke tank uses the extra space available, but doesn't do so at the cost of bulking up the narrow feel of the bike so much that it makes it much harder to move around on, and/or make the bike feel and act much less nimble. You can really see the size difference of the two tanks and where the Clarke tank gets it's extra capacity. There are different color options available including a "natural" color that is slightly transparent. The natural color allows you to see the fuel level in the tank from the outside of the tank. This color will discolor over time. The white will tend to hold it's color better and look better over time. You can still open the cap to see the fuel in the tank which is something that was very hard to do on the stock black tank once the level got low. 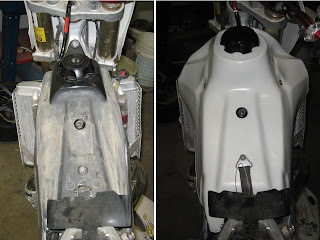 Since the shrouds cover most of the tank anyways, the natural color would kind of lose it's purpose in my opinion. You must re-use many of the parts of the old tank including the screws, the petcock/filter, and the bushing that will go into the rubber grommet. The hole on my tank needed to be enlarged slightly with a round file before the petcock would fit. The o-ring will still make a seal, so don't worry if you have to enlarge the hole a bit. The less you have to remove the better, and take care to keep the hole round for the tightest fit possible however. Since the tank does extend down further than the stock tank, the fuel line will most likely need to be shortened. I only needed to take off about a half inch from the top of the fuel line to get a good fit with no kinks. The fit is very tight in some places! The fork actually hit the tank slightly on mine on the right side, but just barely, then it bottomed out on the stops once the tank deflected. The area over the radiator cap is much smaller too and the tank extends up about 2" or 3" above the stock tank in the gas cap area. It's also harder to get to the spark plug, but not much. These drawbacks are worth it for the extra capacity if you need it! The bike feels basically the same on the trail with the exception of the higher gas cap. 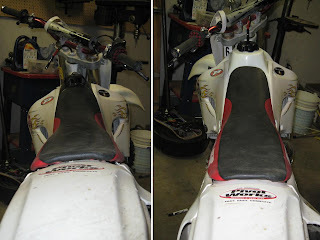 The shrouds still feel narrow and allow for easy movement and control, and the extra weight of a full tank is barely noticeable. These side by side comparisons show the differences. I was afraid that the new tank would ruin the look of the bike, but it really didn't. I really like the way it turned out. The fit of the tank was great, everything lined up right and the install was very easy. Nice. You could use an extra gallon for your trip at Moab this fall, I am excited for the pictures of the trip already!